For those of you in W.A. Luna Outdoor Cinema will be screening exclusively Metal: A Headbanger’s Journey [M] from Thursday 14th December to Sunday 24th December. Screening nightly @ 8.45pm. Doors open 7.30pm. There will be a special opening night celebration with RTRFM92.1 Critical Mass Metal Radio providing music by DJ’s Cube, Nutbag & Muscles, Siena’s on Leederville pizzas* and Feral Brewing Co providing Feral White Belgium Beer* [*whilst stocks last] plus a chance to win vouchers, T-shirts and CD’s from Music Finder. 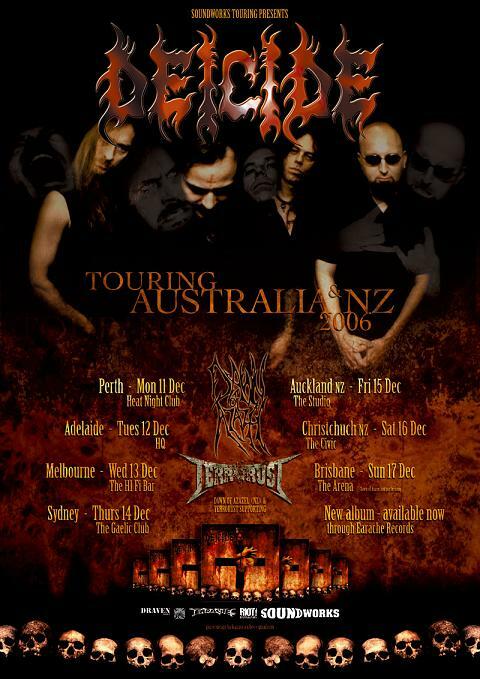 As if anyone needs to be reminded that the Deicide Australian and New Zealand tour kicks off next week, with the first date being Perth on Monday the 11th of December. Tickets are selling fast so you probably want to make sure to pick yours up while you still can. If the recent Cannibal Corpse shows are anything to go by, these ones are sure to sell out as well. For more info and ticketing details see this news item. For the third time, an innocent farm near Scone will be turned into an Open Air battleground to celebrate Australia’s Metal scene. More than half of the 36 bands have already been booked and confirmed, offering a wide range of heavy acts that will blow minds and ears of hundreds of fans. Metalstock will be an All Ages event that provides a spacious camping ground, big screen cinema, bar as well as food and merchandise stalls. Due to high demand, tickets for this unique Australian event will go on sale at the start of 2007, giving fans the opportunity to arrange their journey to Scone well in advance. If you like your bikes, and your music, nasty and loud, then the 2006 Fremantle Motorcycle Show at The Coolbellup Hotel is gonna be your idea of rock'n'roll hog heaven! Kicking off at 2pm, there'll be 12 motorcycle and 6 tattoo competition categories vying for glory, plus a hot rod display, motorcycle swapmeet, trade stalls, a vintage display and more. Entry is $20 for adults, free for kids under 16. After 7pm the kids go home and the evening section of the event kicks in action, with Perth's hardest rock outfit SUBTRUCK performing 3 blistering sets live on stage over the course of the night. Plus there'll be a a dance show and wet t-shirt competition with the chance to win $500. It all happens Saturday December 9th at The Coolbellup Hotel, Coolbellup Ave, Coolbelup. Part proceeds aid Royal Flying Doctor Service. Just added a review of the Malmsteen gig in Perth thanks to Deryk Thomas (of Anger Management fame). It was unfortunate that the supports of local power pride Black Steel and Voyager were pulled at the last moment, but still an awesome show. Also, unforuntately Deryk's camera was confiscated by a bouncer early into the set (though strangely there were plenty of other cameras visible in the crowd the whole way through), so there aren't too many shots to go with the review.